My picture program couldn't quite catch the color of these boots. The background color is lighter. The colors are a bit more vibrant. The style is a comfortable cut. I believe these are a men's 6.5. Please consult measurements. The exterior is a short faux fur. All man made. This pair is not available until approximately 9/27 or 0/28. The unique boots were worn once around 15 years ago, vintage. The boots are all about the look. The insole is approximately 9.5" long for a 9.33" foot. 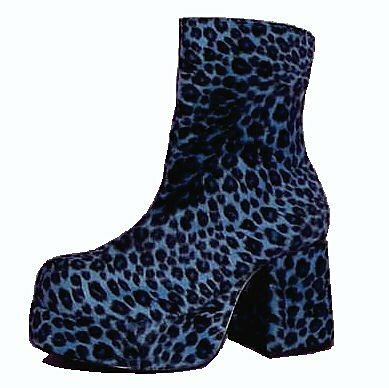 I believe these would fit a woman's 7.5. Shoe cushions can take off length. Measure foot while standing if unsure of length.